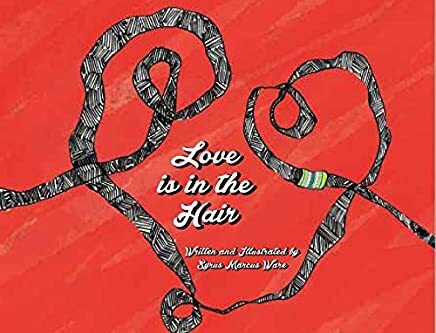 Love is in the Hair, published in 2015 by Flamingo Rampant, is written and illustrated by Syrus Marcus Ware. The sweet story, perfect for bedtime, focuses on a little girl, Carter, with light brown skin and a big smile. Carter is about to become a sister, and is unable to sleep the night before her sibling’s arrival. Her mom and dad are at the hospital and her two uncles are caring for her. Carter wakes her uncles up to comfort her and they do. One prepares warm milk, while the other tells her stories about his life. Each story is inspired by a small object, a bead or string, woven through his long hair. One bead is a reminder of the day she was born. A long thread reminds him of the day he met his partner. After listening to her uncle’s comfortable personal stories about family and love, Carter is sleepy enough to head back to bed and have sweet dreams about the baby she’ll meet the next day. This is a lovely story, perfect for families expecting a new addition. The uncles thoughtful engagement with Carter, and the intimacy shared by all the characters, make it a cozy read that can easily inspire caretakers to share their own family stories with the children they’re tucking in.